������ Chaiyaphum is a province in the centre of Thailand. It is well known in tourism terms because it has beautiful flower fields. Chaiyaphum was founded over 2 centuries ago during the early Rattanakosin period by a group of Vientiane people led by Nai Lae. From Bangkok, take Highway No. 1 to Saraburi and Highway No. 2 to Si Khio, then turn into Highway No. 201 and proceed to Chaiyaphum via Dan Khun Thot and Chaturat, a total distance of 342 kilometres. There are many private companies which operate bus services from Bangkok to Chaiyaphum. Buses depart from Mochit 2 Bus Terminal every day. Call 0 2936 2852-66 or visit www.transport.co.th for more information. Regular trains depart from Bangkoks Hua Lamphong Railway Station to Bua Yai Railway Station which is 51 kilometres from Chaiyaphum. Call 1690, 0 2223 7010-20 or visit www.railway.co.th for more information. Visitors can fly from Bangkok to Nakhon Ratchasima or Khon Kaen and continue the trip by bus to Chaiyaphum. Call Thai Airways at Tel: 1566, 0 2628 2000. From Chaiyaphum, take Highway No. 201 past Phu Khiao to Ban Nong Song Hong for 75 kilometres, then turn left onto Highway No. 2055 and drive for 9 kilometres to Ban Kaeng. There, turn left and drive for a further 5 kilometres. This ancient square-based pagoda is 32 meters wide and 45 meters high. It is one of the most complete and most beautiful pagodas to be found. Incorporating art from the Lanna, Lan Chang and Ayutthaya periods, it is believed to have been built during the 21st-22nd Buddhist century. The present site of the pagoda used to be the site of an ancient city from the Dvaravati period that flourished during the 12th-16th Buddhist century. Traces of a moat and buildings remain. Many artefacts have been discovered here such as sandstone temple markers and Khmer-style sculptures. At Mu 6, Ban Non Salao, Tambon Nong Tum on Highway No. 201, 8 kilometres from Ban Khae, the village is engaged in silk and cotton weaving and local products derived from them such as pillows. Decorative trees can be found at Ban Khae, which is about 1 kilometre from Amphoe Phu Khiao on Highway No. 201. The trees are sought after for garden decoration and they constitute the main occupation of the village. Several trees are taken and bent into interesting shapes, then sold to visitors. The Sai Thong National Park covers 340 square kilometres of Phang Hoei mountain range. The park headquarters is at Tambon Wang Takhe. To go to the park, take the Chaiyaphum-Nakhon Sawan road (Highway No. 225) to Km. 121-122, turn right and drive for 7 kilometres. The most important attraction of the park is Sai Thong waterfall, 1 kilometre from the park office. Water falls smoothly down rocks, about 100 meters from top to bottom. 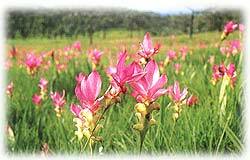 There is also a wide field of Dok Krachiao that rivals the flowers in Pa Hin Ngam in Amphoe Thep Sathit. The field can be reached only on foot and visitors should stay there overnight. This cliff is part of Lankha Mountain, 36 kilometres from the city on Highway No. 2159. Along the road there is large rock jutting out. At the top is the Chaiyaphum Phithak Buddha image standing 14 feet high. The cliff offers a good view of the area. The Tat Ton National Park covers some parts of Phu Laen Kha mountain range. To get there, take Highway No. 2051 for 21 kilometres. Tat Ton waterfall is an important tourist spot. The water here cascades down wide rock plateaus, creating breathtaking scenery, especially in the rainy season when there is plenty of water. The park also has Pha Iang waterfall, which is 32 kilometres from the city on the Chaiyaphum-Nong Bua Daeng road, and Tat Fa waterfall, which is 25 kilometres from the city on the Chaiyaphum-Kaeng Khro road. This khmer sanctuary is at Ban Nong Bua, Tambon Nai Mueang, 3 kilometres from the city. Prang Ku is a Khmer-style ancient site built in the 18th Buddhist century. The main pagoda is square with a length of 5 metres on each side. A stone Buddha image in the meditation posture from the Dvaravati period that was moved from elsewhere is beside it. A building is situated in front of the pagoda surrounded by a wall. Everything is made of laterite except for the door and window frames, the lintel and columns that are made of sandstone. Outside the wall is a pool in perfect condition. With an area of 200.5 sq.km. in mountainous terrain, the habitat of this protect - forest park range from thick forest to sparse woods. The site contains a variety of natural beauty of cliffs, stone ground, and strange rock formations. This monument is at Sun Ratchakan roundabout on the way into the city. The people of Chaiyaphum built it to honour the citys founder. This shrine is on the bank of Nong Pla Thao, 3 kilometres from the city, on the way to Ban Khwao. There is a large tamarind tree on the bank, which is said to be where Chao Phraya Lae died fighting Vientiane soldiers in 1826. This wildlife reserve is on the same way as Chulabhorn Dam between Km. 24-25. It has an area of 1,560 square kilometres. The geography consists of a sandstone mountain range with high cliffs. The verdant jungle is the watershed of an important river of the Northeast called the Chi and is home to an abundance of wild animals, as well as over 350 bird species. The reserve is ideal for studying flora and fauna. The most interesting spot is Thung Kamang, a grass field that is the grazing ground for many animals. The reserve is open only to persons wishing to study nature. Permission must be obtained from the reserve chief by writing to P.O. Box 3, Chum Phae Post Office, Khon Kaen or contact the Wildlife Reserve Section, Royal Forestry Department, Bang Khen, Bangkok. Chulabhorn Dam is at Tambon Thung Phra and dams the Phrom River. It is a rock-filled dam with an earth core. The dam is 700 metres long and 70 metres high. It is used to generate electricity and irrigation. Boat rentals are available to view the sights of the reservoir. To get to the dam, take the Chaiyaphum-Chum Phae road (Highway No. 201) to Nong Song Hong junction, then turn left onto Highway No. 2055, a total distance of 120 kilometres from Chaiyaphum. Ban Khwao district is famous for silk weaving and cotton of good quality and lovely designs. It is particularly well known for its Mat Mi silk that is popular among those who favour traditional fabrics. The district is 13 kilometres from Amphoe Mueang on Highway No. 225. Another attraction here is the large swamp that is home to waterfowls, which migrate here during October to January. Phu Phra is at Ban Kanaisa, Tambon Na Sieo. It is a small mountain with drawings of Buddha images from the U Thong period on the face of a cliff. They date from the 18th-19th Buddhist century, around the early Ayutthaya period. There is a fair to pay homage to the drawings every April for 3 days. To get there, take Highway No. 201 (Chaiyaphum-Phu Khiao) for 13 kilometres, then turn left onto the Na Sieo-Huai Chan road and drive for 6 kilometres. Narinthawat Farm is at Km. 28 on the Chaiyaphum-Phu Khiao road. The farm has shelters decorated with an assortment of flora. A distinctive feature is the many carts from the regions of Thailand, some over a century old with beautiful woodcarving designs. ยอดภูคิ้ง มีจุดท่องเที่ยวหลากหลาย เช่น ทุ่งหญ้าสะวันนาที่มีความกว้างคล้ายสนามกอล์ฟบนภูเขาสูง พันธุ์ไม้ กล้วยไม้และสัตว์ป่านานาชนิด แลหินเงิบที่มีลักษณะเป็นหินวางซ้อนทับคล้ายเพิงหมาแหงนบริเวณนี้เป็นแหล่ง กำเนิดพืชกินแมลง "หม้อข้าวหม้อแกงลิง" แลหินจ้อง ห่างจากแลหินเงิบ 3 กิโลเมตร จะเห็นเนินมหัศจรรย์วางซ้อนทับกับก้อนมหึมา แต่มีจุดตั้งเล็กๆเท่ากำปั้นเท่านั้น ชาวบ้านเรียก "หินจ้อง" หมายถึง ร่ม ในภาษาถิ่น เรียกว่า "แหลหินตัง" หรือ "แหลพรานอ่อน" การเดินทางพิชิตยอดภูคิ้ง ดังคำพูดเปรียบเปรยว่า "สี่ภูกระดึงยังไม่เท่าหนึ่งภูคิ้ง"
สถานี วิจัยเพาะเลี้ยงสัตว์ป่าภูเขียวอยู่ก่อนถึงเขื่อนจุฬาภรณ์ 8 กิโลเมตรด้านซ้ายมือ มีสัตว์ป่าให้ชมหลายชนิด โดยเฉพาะกวางป่า ละอง ละมั่ง เปิดให้เข้าชมทุกวันระหว่างเวลา 8.00-16.00 น.